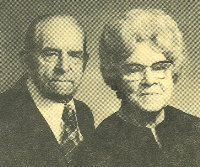 George Lester Carson was born on August 20, 1892 at Salem, Utah County, Utah Territory to George G. and Rebecca Adaline Bingham Carson. I was educated in the Utah County Schools and attended BrighamYoung University. When I was about seven years old, my parents and brother Augustus spent the summer at Baty Springs in the hills north of Etna, Box Elder County, State of Utah, where my father had a herd of sheep. We lived in a sheep camp. Gus and I slept under the bunk which was used to store supplies. One day Gus and I got on a horse and started out to find a dipping corral; we became lost and rode about eight miles before finding a sheep herder who fed us and put us to bed. During the night Dad found us and took us home. We spent some Summers at Soda Springs, Idaho. When I was eight years old, after the sheep were sheared, I drove one wagon and Dad drove the other to take the wool to market. We had to cross a bad creek so Dad took his load across and then came back to help me get my load across the stream. A friend of our family, Bill Snow, gave us kids a goat. Bill’s father had planted some fruit trees and the goat had chewed the bark off of the trees, and he was going to kill the goat. My dad bought a little wagon and had a harness made and every morning we hauled eight five gallon cans of milk to the creamery. All the kids in the area would jump on the little wagon to have a ride. You could hardly see the outfit when they all got on and the poor goat could hardly pull the load. Later we had a horse and a bigger wagon to haul the milk to the creamery. We earned between $17.00 and $23.00 a month. After skimming the cream, we would haul the whey to the farmers so they could feed it to their pigs. Mother would walk along the ditch bank to help us gather the wheat left by the farmers to feed our chickens. My brother, Gus, and I had quite an imagination. While at Soda Springs we bottled water and tried to sell it. We picked strawberries to earn money. Mother hurried to make a nice dinner for her hard working boys. We earned twelve cents each. One year the grasshoppers were so bad that we made a catcher to hook behind the saddle on our horse and would run through the field and catch them by the hundreds. We were paid by the pound, but I don’t remember how much we received. When I was twelve we were north of Grouse Creek, Box Elder County, Utah. We had to dip the sheep twice that year for ticks and scab. We ran out of sulphur to dip with. My father sent me with one of the hired sheep herders to Kelton, Utah to get a load of sulphur. We loaded the wagon and the herder caught the train for Ogden. I started back to Grouse Creek, thirty-five miles, with the team and wagon. It was late and the wind came up – oh – you never saw such a wind in your life. I tried to keep the quilt tucked around me to keep me warm, but the wind kept blowing it out like a balloon. I saw a light in the dark and stopped to ask if I could stay the night. Roy Pugsley of Park Valley said, “I can’t turn you away on a night like this.” He took me in by the fire to get warm while he took care of the horses. I slept with his son out in the sheep camp that night. The next morning I hitched up the team and started on my way through the mountain to Lynn, Utah, where I stayed the second night. Mrs. Lind didn’t think I was dressed warm so she gave me a coat. I got back to the dipping vat about ten the next morning. On February 12, 1912 I married Helen Janette Christianson, whom I had known all my life, in the Salt Lake Temple. On November 20, 1912 a baby boy was born to us. We named him Max Lester. We were living in Salem at the time and I was farming. 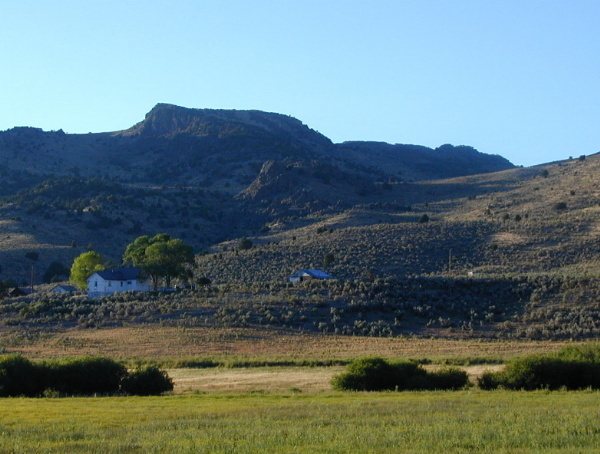 We also spent some time at Father’s ranch north of Grouse Creek in Box Elder County. Helen died on July 5, 1916 at Salem. My mother and father took Max to raise. In August 1918 I was drafted and went to have an examination to determine if I was fit to join the Army, and after the exam I went to talk to a friend of mine and said “I passed with flying colors.” He advised me to go sign up for training school in Salt Lake City. He said, “I’d be there two months and maybe by the end of training the war would be over.” I signed up and landed in Salt Lake City for training. I trained at the University of Utah, Fort Miley, and the Persidio in California. While at Persidio we were getting ready to ship over to France when they got word that the Armistice was signed. It was signed November 11, 1918 and I was discharged just before Christmas. I was in the Army a total of four months. In the spring of 1918, Leona Wakefield from Grouse Creek came to the ranch to help cook for the sheep herders. This is how we became acquainted. When I was twenty-seven and she was twenty-three we took the mail stage (Model T Ford) to Lucin, Utah and caught the train to Ogden. The fare was $4.00 each. 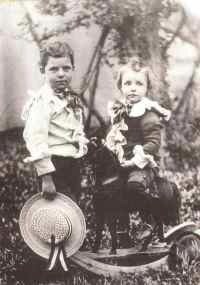 We were married on March 3, 1919. I wore my Army uniform and Leona wore a changeable blue dress she borrowed from her sister. We stayed at the hotel at 25th and Grant for $2.00 a day. We ate at the BonTon. Hamburgers were thirty-five cents and movies were only ten cents. We had two daughters, Adele and Venice. We spent forty years at the ranch, which was sixteen miles from Grouse Creek. The only way to get around was by horse and wagon so we didn’t get away much. Very hard times – all work and no play – so we just lived at the ranch the year around. In those days we had no electricity, no phones and no inside water or facilities. Some winters we would move with the sheep to Wendover. One morning we woke to a lot of snow and couldn’t see any sheep. As the sun stated to melt the snow the sheep began to move. They had been buried by the snow. On March 9, 1926, the hired hand (Oather Hopper) and I were cutting firewood with a gas powered saw. A stick had lodgedunderneath, I reached down, without turning the saw off, to dislodge the stick. The blade caught my left hand, the two fingers and thumb were hanging, with blood gushing everywhere. I rushed to the house where Leona placed an ironed dish towel underneath and one on top. We had an old Model T Ford that she and Oather finally got started. With Adele holding Venice in the back seat, we started for Grouse Creek. It was muddy and slick, so I finally took over the driving with one hand. In Grouse Creek, Leona’s brother, Arlin, took us to catch the train at Lucin. We arrived in Ogden at 5:00 a.m. on March 10th. At the Dee Hospital I ask for the best doctor available. Doctor Dumke was called and he operated – tied tendons together and sewed my hand together. I had very little scar and no loss in use of my hand. My family lived in Grouse Creek during the school year and I would ride my horse the sixteen miles (four hours each way) through deep snow every two or three weeks to bring them eggs, meat, etc, pulled behind the horse on a toboggan. Sometimes the toboggan was on top, sometimes the supplies were. It was a rough ride in the deep snow. In November 1937, I took over the ranch and livestock business from my father, with my brothers, Gus and Randle. We pulled us out of debt in eight years. The winter of 1949 was very bad, with great amounts of snow. The feed for the cattle was gone and things looked very bleak. The United States Government came to our rescue. We purchased bales of hay and trucked it to Hill Air Force Base just south of Ogden, loaded it on planes, and an Air Force pilot flew us out over the ranch. He would fly very low over the feeding area and we would push the hay out the cargo doors for the livestock. In the early days of our business we would trail the lambs to Lucin about forty-three miles to the railroad cars to ship them to market. Later the buyers would come to the ranch and buy them then send big trucks to haul them to market. The trucks could haul 203 lambs at one time. Some years we would have as many as 5,000 lambs for the market. We hauled the wool to Lucin in the wagons, but then we finally got big trucks and we would haul eighteen sacks (three layers high) at a time. In 1965 we sold the ranch and all range land (about 33,000 acres of deeded land and 1,000 acres of range land) to J.R. Simplot fromIdaho. On July 4, 1965 we packed our personal belongings and drove away from our home of forty years. Our home in Ogden was at 1220-32nd Street, just west of our daughter, Venice and her family. Both of our son-in-laws traveled a lot with their work and we went along on some lovely trips. Our children honored us in March 1979 with a 60th Anniversary dinner and open house. We had four more good years. Adele died of a heart attack on July 27 1981. On August 20, 1982, I turned ninety years old – a proud day – I was well enough to still drive my car. On Friday, February 11, 1983, we went to the bank. (Dad was always mentally alert). Sunday, we tried to get him up, he was so weak. Mother, Harold and I were at his bedside when he died at about 2:00 p.m. on February 13, 1983. He was buried in the Ogden City Cemetery.